Though each daylily (Hemerocallis spp.) flower only lasts a day, you can have blooms all summer long if you plant the right type. Reblooming or everblooming varieties are repeat bloomers with little or no space of time between the flushes of bloom, so the plants stay in bloom from early summer to the beginning of fall. Tens of thousands of daylily cultivars exist, leading to many flower shapes and color patterns. One the best known reblooming daylilies that provides color from late spring through fall is "Stella de Oro" (Hemerocallis x "Stella de Oro"). This variety produces 2-3/4 inch yellow-gold blooms and is hardy in U.S. Department of Agriculture plant hardiness zones 4 through 11. The "Blackeyed Stella" (Hemerocallis "Blackeyed Stella") variety is similar, but its blooms feature a dark red eye. This cultivar is hardy in USDA zones 3 through 10. The variety "Happy Returns" (Hemerocallis "Happy Returns") is a descendent of the "Stella de Oro." This everblooming daylily, which produces lemon-yellow flowers that reach 3 inches wide, is hardy in USDA zones 3 through 9. 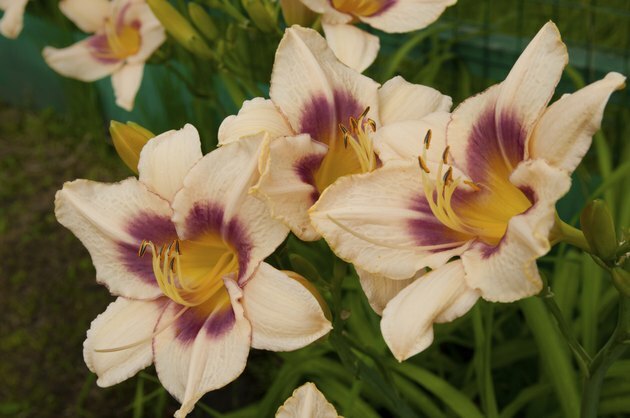 Other varieties in the "Returns" series, by the same hybridizer, provide more colors of everblooming daylilies. "Dynamite Returns" features ruffled red flowers, "Rosy Returns" reveals pink petals and "'When My Sweetheart Returns" produces pink and cream blooms. Many other everblooming and reblooming day lilies exist. "Fairy Tale Pink" daylily (Hemerocallis x "Fairy Tale Pink") produces pale apricot-colored flowers, and "Little Grapette" dwarf daylily (Hemerocallis x "Little Grapette") blooms dark purple. Both varieties rebloom throughout the summer and are hardy in USDA zones 4 through 11. Some daylilies with double flowers also reliably rebloom, like "Night Embers" (Hemerocallis x "Night Embers"). This variety blooms dark red from early summer until frost and is hardy in USDA zones 5 through 9. Deadhead daylilies regularly to encourage more flowers. Remove spent blooms every day, and cut the flowering stem back to the ground after all blooms disappear. Because daylilies have thick stems, the best way to deadhead them without breaking off any surrounding blooms is to use sharp scissors or pruners. Disinfect cutting tools before use by soaking them in a mixture of 1 part bleach to 3 parts water, then rising in clean water. Dividing plants every three to five years also encourages prolific flowering. Early spring or right after flowering are the best times to divide, but it can be done throughout the growing season. To divide plants, lift the entire clump with a gardening fork and use the fork or your hands to divide it into sections. Daylily clumps contain individual plants with a fan-shaped group of leaves attached to roots. When you divide, leave at least four fans in each division. Re-plant the new clumps at the same level they were originally growing, and water thoroughly.